I used the Hipster extensively on my PCT and CDT hikes – especially in cold weather when I want my phone and maps somewhere other than my shirt pockets (too much unzipping!). I’ve also used it extensively for day hikes, trail running and mountain biking. It’s perfect for hiking – holds a phone, maps and other daily necessities like lip balm or smoking supplies. I have an older version, and the volume really works best with EITHER a phone or snack, not both. The pack is also water resistant, so I feel confident keeping my phone there without a plastic bag, even in pretty wet conditions. It bounces around on MTB or running trips, but is generally fine & secure as long as it’s not overloaded. I like the key hook – it prevents nightmares about being locked out at the trailhead. The quality is excellent, I’ve probably travelled 3000 miles with mine and it’s not even showing wear, and washes up well. I also love/hate the design, which tends to keep the pack closed – if u forget to zip u wont lose your ish, however it makes single handed operation/getting a IPhone6 (normal size) out sometimes frustrating. It’s probably sewn in Taiwan, but you get what you pay for at $20. Overall 7/10. Bummed about the overseas sewing, but profile is most likely to get used around town. A newcomer to the fanny pack market, Thru. is making some beautifully made-in-America boutique hip belts. The Astronaut is their flagship model, made of translucent Dyneema (nee cuben fiber) with a waterproof zipper and webbing pulls. A more full figured pack, it features an interior zipper pocket (with separated ID/loot slots) and an open back pocket. The volume offers enough room to carry a windshirt, any smartphone, gloves, hand sani & minor first aid, and smoking accessories on the inside, while also comfortably accommodating a quart freezer bag of snacks in the open back pocket. Carrying this extra weight is all made possible by the awesome “Comfy Strap” – made of webbing and spandex, which helps reduce friction and fatigue with its wide footprint. 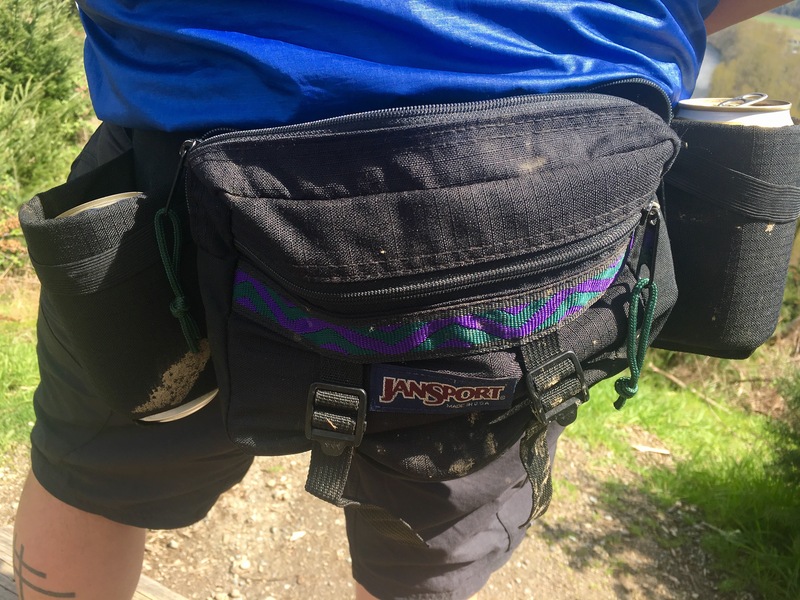 Sure, the extra volume makes it too bouncy for running, and I wouldn’t trust the open back pocket for anything during an MTB shred – but this is a real winner for longer day hikes or as part of a hipbelt-less pack system for backpacking. I also use mine daily in the garden – I’m a profession flower grower- and it’s the best size for all the essentials; scissors, blade, twisties & zip ties, gloves and iPod with room for extras. I also hafta say – I really love American made products, and this is made by backpackers for backpackers in Norfolk, VA. Having spent a fair amount of time hunched over a sewing machine, I’m can say the Astronaut features superb construction, and I can see it lasting thru years of abuse. I look forward to finding out. 9/10 – awesome quality and functionality American made gear. PS if u think $80 buck is large coin for a fine American made product, it’s totes in the range of other similar products like the awesome, MTB specific Hunter Cycles Shred Pack. If you want cheap, think kids in China. 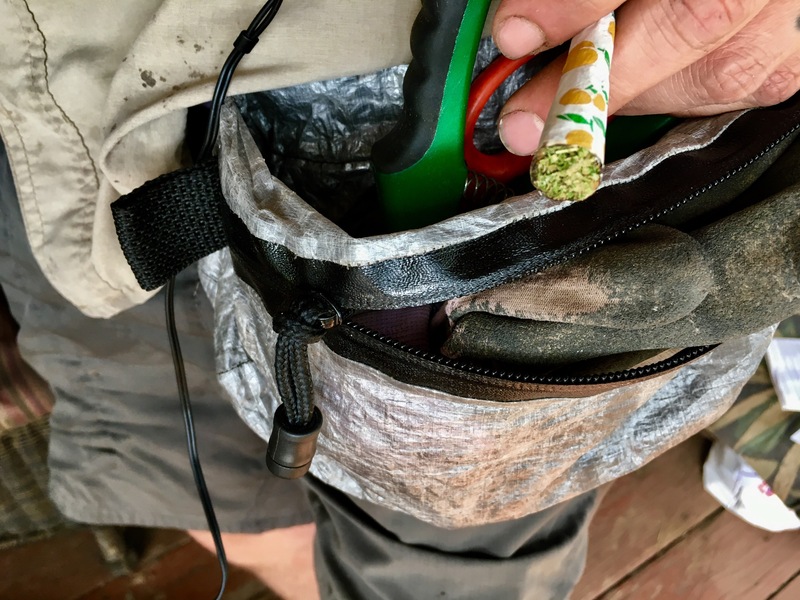 While not technically a hip pack, I often slide the MLD Pack Pocket on my webbing belt that keeps up my short shorts when I shred the MTBs, or when I’m riding around town. 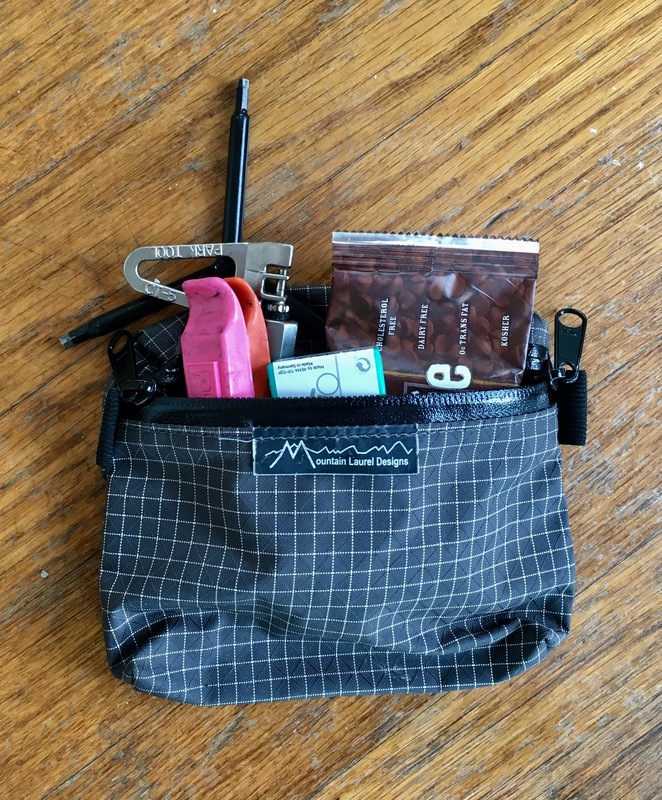 The Pack Pocket is compact, waterproof, and just large enough to keep an iPhone 6, a couple of tire levers and patch kit, OR maybe a snack & your ID/loot. I’ll admit it’s not efficient for hiking (not quite enough volume without a backpack to back it up), and bounces too much for trail running. But it’s a great cycling tool. If you’ve ever tried to fish your ID and money out of a messenger bag (which happens to have the inside coated in wheatpaste, that’s another story) u know it’s basically a black hole. It’s nice to keep a few things easily accessible. The Pack Pocket is also super durable – I’ve scraped mine on both concrete and dirt (I’m really good at falling off bikes), and it’s not even showing wear. Highly recommended. Also, I guess you could actually put it on a backpack hip belt, tho I’ve not tried. Overall 7/10 Kinda awkward to use with a normal belt, but does work great for extra storage, and iz American made & super cheap. The Cadillac of fanny packs, with 2 zippered pockets, key leash, external compression straps, and integrated water bottle (or beer) holsters. This thing is massive, and meant to compliment your full size gaiters. It’s also awesome if you want to stash 4 trail beers, tools, and some snacks for an afternoon shred – and they are readily available at the thrift (at least in the northwest). A definite contender, but too heavy for long distance hiking use, and too many features for day trips unless you’re biking. But check out that awesome gros grain! Overall 7/10 Nice price, 90’s accents, but too klunky for everyday use. 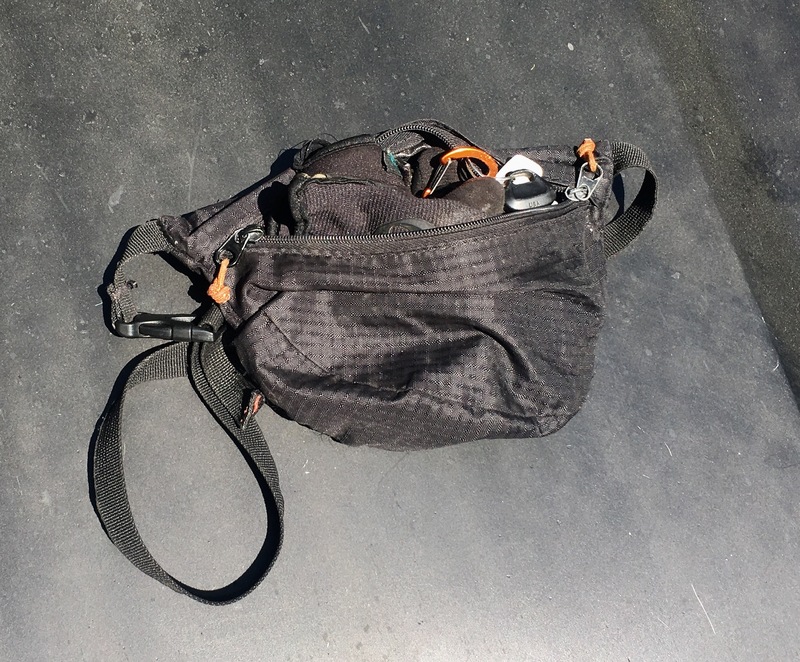 This entry was posted in wrong way gang and tagged backpack, fanny pack, gossamer gear, hipster, mountain laurel designs, packing, packs, portage, thrupacks on May 10, 2017 by GROUCHO.